Irish Independent's Amy Molloy who was presented with the Upcoming Business Journalist of the year Award pictured with Irish Independent journalists Shane Phelan, Dearbhail McDonald and Sunday Independent reporter Samantha Mc Caughren who were presented with the Business Story of the year at the UCD Michael Smurfit Business Journalist Awards 2018 in the Westbury Hotel. Irish Independent journalists Shane Phelan, Dearbhail Mc Donald and Sundy Independent journalist Samantha McCaughren who were presented with the Business Story of the year at the UCD Michael Smurfit Buisness Journalist Awards 2018 in the Westbury Hotel. Irish Independent journalist Amy Molloy who was presented with the Upcoming Buisness Journalist of the year Award at the UCD Michael Smurfit Business Journalist Awards 2018 in the Westbury Hotel. Four Independent Newspapers journalists were honoured at the UCD Smurfit School Business Journalist Awards 2018 yesterday. 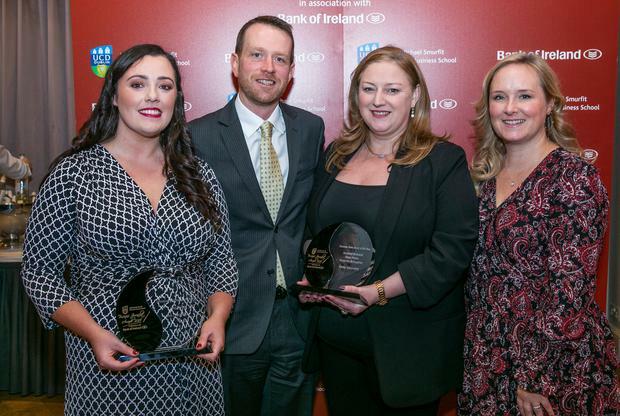 Group Business Editor Dearbhail McDonald, Irish Independent legal affairs editor Shane Phelan, and ‘Sunday Independent’ business editor Samantha McCaughren won the prize for ‘Business News Story of the Year’. The award came in recognition of their coverage of the Office of the Director of the Corporate Enforcement’s investigation into the alleged data breach at Independent News and Media, the publishers of the Irish Independent and ‘Sunday Independent’. Irish Independent and Independent.ie journalist Amy Molloy was joint winner in the ‘Upcoming Journalist’ category for a portfolio of work she submitted. The awards are organised by the UCD Michael Smurfit Graduate Business School.